Life as the mother of a preschooler is new for me. We enrolled Salem at the local elementary school about a month ago, and I am still getting used to the early mornings, the Mom Line of traffic, the deluge of artwork that comes home with him begging for display, and the inevitable need for a festive hat to wear for Holiday Hat Day. When you move twice in one year, you are bound to lose a few things. It is tragic, however, when somehow you have misplaced your Christmas ornament collection, your handmade Christmas stockings, and all of your holiday memories from the past 7 years, including the coveted holiday hats. I currently have a naked tree covered in twinkle lights desperate for some Beasley-family personalization, but that is another post for another day. In my attempts to remain positive despite our orphaned Advent tchotchkes, I set to work making a holiday hat for Salem to wear for Wear-Your-Holiday-Hat-To-School-Day. Necessity, meet the Mother of Invention. I enlisted his help yesterday afternoon even though his…errr…”exceptional tendencies” make arts and crafts projects a complete torture. Young Aspergians are often challenged by fine-motor activities such as coloring and cutting with scissors, and they certainly don’t like to be hovered over and touched constantly all in the name of a holiday craft (which lets face it, usually ends up being some ridiculous looking accessory from which a child will spend their whole adult life recovering… Asperger’s or not). That is true in Salem’s case, I’m afraid. Yes, I took this shot while he was sitting on the potty, but it was the only time I could get him to try it on without wiggling too much so I could snap a decent photo. 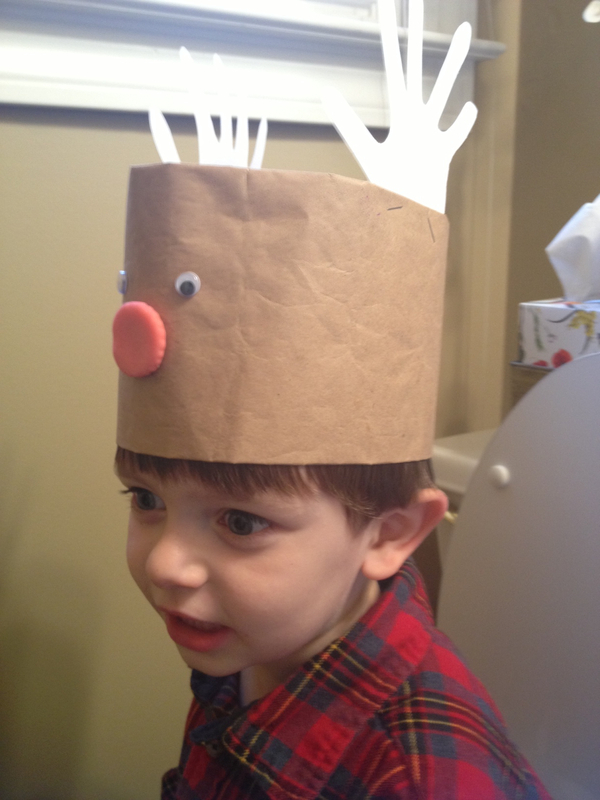 Judging by his expression, one caption might read, “Isn’t it bad enough that you are taking a bathroom picture that will inevitably resurface around the time I bring home my first girlfriend, but now I am reduced to wearing this reindeer hat with a Kranky-Patty-gummy-for-a-red-nose too?” We wrestled with Rudolph for a moment last night before I remembered that Salem doesn’t exactly take to new things very easily (unless of course they cost $1.99 in the app store). So, I quickly traced his sister’s hands and made a reindeer hat for her to model for him, which didn’t last because she was more interested in eating her Kranky-Patty-gummy-for-a-red-nose. So, Rudolph rode on the dashboard of the minivan last night while we delivered dinner to a friend, made an appearance at a school function, and concluded the evening with some Chick-Fil-A therapy. By this morning, Salem had developed a slight affinity for Rudolph and was willing to wear him into the school despite the latent embarrassment for years to come. But somehow in all the commotion, we lost a googly eye. Thank goodness for pre-school, a magical land flowing with finger paint and googly eyes. 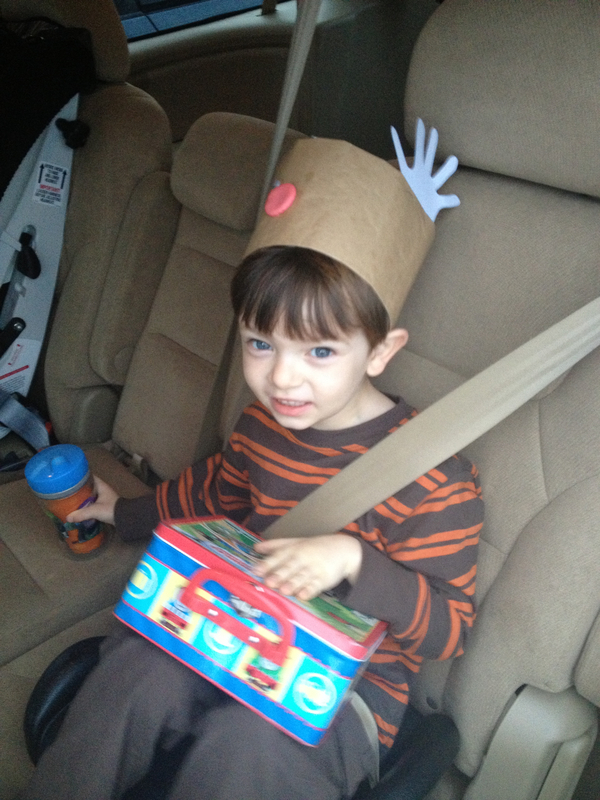 Salem, his dignity, and Rudolph made it safely off the bus with a replacement googly eye (compliments of his Fairy-God-Teacher) firmly applied to his hat for future holiday self-consciousness. Craft now and beg forgiveness later…. That’s my motto! Hahahaha! So precious! Salina you are an amazing Mom!